A well-designed baby-gate in the home is a major KEY to keeping your baby safe! But finding the perfect baby-gate is not so easy! Have you tried searching on Amazon for one? There are so many choices, that it is truly overwhelming! list of: The BEST Baby Gates of 2019! Don’t assume that all baby gates are made equal. It is important to avoid any that are unstable, too short, or have potential footholds that a child could use to climb over. If a gate is not designed well, it can actually be more of a danger than a safety item! Already know basics about baby gates? Go straight to review our careful picks for you. 1. What size is the opening? One of the main factors that will ultimately determine which gates will work for you is the size of the opening that you are wanting to block off. Check carefully what the minimum and maximum size the gates come in, taking into account their ability to adjust. Some gates come with extension pieces and other gates have an option of extensions, but they have to be purchased separately. No matter how great a gate is, if it is too big or too small for your needs, then you will need to keep searching! 2. How tall is your child? Another consideration that will influence which gate you will want is how tall your child is. A general rule of thumb is that the gate should be at least ¾ of their height. This means that you will not want a gate that is any lower than about their chest or shoulders. If your kiddo can lean over the gate...chances are that you will need to get an extra tall gate. Keep in mind that baby gates are only meant for younger children that are not overly strong, are less than about 30 lbs., and are shorter than 3 feet. Once they are older and bigger than what the gate is designed to contain, it actually becomes more of a hazard than a safety item. Ready To Find The Best Baby Gates? Finding the best baby gate for your specific needs is one of the trickiest shopping chores that a parent can face! This is because every home is unique and has its own set of issues to overcome -- with everything from stairs and wide spaces to angled walls and low baseboards. So to make your job a lot easier, I have divided the Best Baby Gates into 10 Specific Categories that cover a wide variety of situations that nearly every parent will encounter. Baby gates for standard spaces are typically designed for an average-size doorway found in most homes. This is the most common type of baby gate purchased and is a great place to start in your search for the perfect gate. Though they may vary in size, or come with optional extensions, these gates will generally cover the basics. Finding just the right gate for a standard doorway can be a daunting task. There are so many choices on the market that it can quickly become overwhelming. Here we have laid out the top choices that have the best reviews, most features, and safest construction, so that you can easily see at a glance what gate would work best for you. By narrowing down the choices to the best picks, we are giving you suggestions that actually work so that you don’t have to deal with any inconveniences when choosing a baby gate. Why did we choose "Easy-Close Gate" by North States as our #1 pick? For a basic all-around awesome pressure-mounted gate, this is my #1 recommendation. Not only has it received excellent reviews by consumers, it is so simple to install that it takes all the guesswork out of baby proofing your home! Not only is the walk-thru door fairly wide, but it opens easily with one hand. It also swings open both ways and can be locked open at 90 degrees. It is available in two colors (white or bronze) and is a durable steel gate that is strong and sturdy. Also, it comes with two extension pieces so that you can easily adjust it to fit the most common standard doorway widths. A large percentage of your baby-gate needs will be met with this one simple solution, as it is one of the best baby gates! If you have an extra wide doorway or an open space between two walls (up to 5 feet), a wide gate is a perfect solution for you. 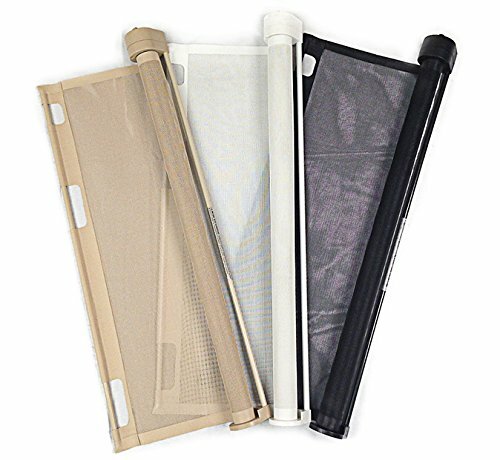 In this category, we have reviewed products that are specifically designed to cover wide spaces and that are also pressure-mounted, without the need to install with permanent hardware. After careful research, I have come to the conclusion that there are not very many options for wide gates that can be installed with pressure-mounts only, although there is a much wider variety for those that require hardware. For this reason, there are only two products that I can recommend at this time that fit this criteria. Why did we choose Summer Infant Decorative Wood & Metal 5 Foot as our #1 pick? This is my #1 pick because not only is it a beautiful and well-made gate that will complement your home, it also features a 26”- wide door that swings both ways and has a one-handed safety latch. It comes with several extensions that you will need to get it to its maximum width. Made of both metal and wood, this gate is built to last. It is on the pricier side, but if you can afford it, would be a great addition to your childproofing accessories. If you have less than a standard doorway that you need to babyproof, the very best baby gate option is a retractable one as there are not any standard size baby gates that will work in narrow spaces. These type of gates are permanently-installed and retract around a roller, much like a measuring tape does. This allows them to span either a small or larger distance, depending on their size. These are definitely a unique kind of gate that have a very special use and function! To help you avoid the inconvenience of sifting through a ton of information, we have narrowed down the list of retractable baby gates to those that are most likely to perform well in this category, and that have the best features and overall safety, and the most reasonable prices. Why did we choose Retract-A-Gate as our #1 pick? As a parent of a toddler myself, I have found this gate to more than adequately meet our needs and I have personally enjoyed its addition to our home. It is my #1 suggestion to other parents because of its quality and function, as well as the stellar customer service of this company. Some of the features of this gate are: It has a high-quality mesh, one-handed open and close feature, locking mechanism, and automatic retraction. Plus, it comes in two sizes (up to 52” and up to 72”), so it works for both very narrow spaces, as well as wider areas. Keep in mind that this gate will need to be permanently mounted into position. This category of baby gates is especially important because not just any gate will do. You must properly install a hardware-mounted gate at the top of stairs because it is the most dangerous place in the home. A baby risks serious injury tumbling down the stairs if an improper gate is installed or if a gate is improperly installed. As there are different types of stairways, we have divided this section into three separate categories so that you can find just the right gate for your situation. The Cardinal Gates Stairway Special Gate product is perfect for if you have two flat surfaces to mount to. It is very durable and can be attached at up to a 30 degree angle! Extensions can be purchased if you need to span a wider area and it is designed to swing fully open with one-handed operation. It is made of lightweight aluminum and comes in either white or black. We have chosen this as our #1 pick for this category based on all these features, as well as the fact that 82% of customers have rated it either 4 or 5 stars, showing it to be a real favorite among consumers. If you have a round post (or two of them) at the top of your stairs, you will need the Cardinal Gates Stairway Special Gate (the same gate that is referenced above) which can accommodate the Cardinal Gates Clamp, Round and transforms the gate by giving it the option of attaching to a newel post or baluster. Please note that you will need one kit for each round newel post that you wish to mount to. If the top of your stairs has open railings or have no place to attach a baby gate, then you need a special gate indeed. We have researched products to baby proof this unique situation and have come to the conclusion that there is only ONE real choice, namely a Regalo Gate. This system features a walk-thru door and the panels can be configured in many different angles and shapes. It is super long to allow you to stretch it across areas that are dangerous but don’t have normal door jams or stair rails. It is designed to be attached permanently to walls, even if they are not directly across from one another. This is not a free-standing gate. Depending on the space that you are trying to span, you will need to choose between the two different lengths that the Regalo gate comes in: either 76 inches or 192 inches. Though any of the gates that can be used at the top of the stairs can also be used at the bottom, you can also use a pressure-mounted gate if you have surfaces on each side of the stairway. If you have two flat surfaces, my recommendation is the North States Supergate Easy Close Metal Gate mentioned earlier on option #1. Why is this our favorite gate to install at the bottom of stairs? Not only is it a great all-around customer favorite in the pressure-mount category, it also features a fairly wide walk-thru door, and opens easily with one hand. Though it can swing open both ways normally, obviously that is a feature that won’t come in handy at the bottom of a set of stairs, but it can be locked open at 90 degrees, which is great if you need to pass through several times in a row or need hands-free access. If you have one or more round posts, then my recommendation is the Dreambaby Chelsea Auto Close Security Gate because of the option to add special Y-shaped adaptors to help grip a round surface with the force of the pressure-mounted hardware. Even beyond that, this is just an all-around awesome gate. The whole gate swings both ways, so you can install it to open away from the steps and it also has an automatic close and latch system. Another consideration: Keep in mind that you can also use the “Easy-Close Gate by North States” that is referred to above with the Dreambaby Adaptors, since they also work for other gates. If you have a more difficult area at the bottom of the stairs to partition off, then I recommend once again the Regalo 192-Inch Super Wide Gate and Play Yard mentioned above. This category of gates are extra tall, so they do a better job of keeping animals and children contained. The average safety gate generally is around 30” - 32” high, but an extra tall gate could be anywhere from 36” to 41” tall! There’s no way around it. Sometimes you just need this kind of specialty gate. With so options on the market, it can be daunting to figure out which one is right for your specific needs. Though they may each have great features or good reviews, we want help you narrow down your choices to the gates with the most awesome features and the best reviews. This will save you time and inconvenience. Take a peek at the top three extra tall gates that have captured our attention. Why did we chose Dreambaby Chelsea Extra Tall Auto Close Gate as our #1 pick? This is almost the tallest gate on the market, and definitely the best tallest one I could find. It has a bunch of great features such as automatic closing, a door that swings both ways, one-handed operation, and the option to buy extensions to make it as wide as 111 inches. Consumers have consistently reported that it is strong and durable, which makes this gate really stand out from the competition. Do you need to install a gate on a porch or deck? This type of gate is specially designed to handle the rigors of weather and temperature fluctuations that happen outdoors. Generally these gates are made with weatherproof materials or coatings that protect the gate from wind, rain, snow, ice, and sun and help the gate last longer. There are not many outdoor safety gates on the market that truly can withstand the harshness of the weather, but of all the ones that we reviewed, we were most impressed with the quality and features of the Cardinal Gate. Because of consistent great reviews that have referenced the function, safety, design, and weather-resistance of the Cardinal Gates Outdoor, these are the ONLY ones that we can recommend at this time. This is a great permanent-mount outdoor gate that is designed to withstand the elements! It has the option to be opened both directions or to install a “stop” bracket if you want to put it at top of stairs. It can be installed with an angle up to 30 degrees, which is perfect in case your deck railings are not perfectly aligned. It is made of steel and lightweight aluminum and comes in two colors (brown or black) and has a rustproof powder-coat finish. This is definitely one of the best baby gates on the market that is also waterproof! When you need to block off an area, but don’t have any walls to attach to (or don’t want to mar the walls in any way), your best bet is a free-standing gate. This kind of baby gate just stands, on its on two feet (or more if necessary!). Once you have it assembled, move it right into position, as it doesn’t require any installation. Though there are several choices for free-standing gates, many have received low ratings and less-than-stellar reviews, so it is important to us to find and recommend only top-rated products that go the extra mile for consumers. We were impressed with the large number of consumers that have been happy with the performance, function, and beauty of the the Richell Deluxe Freestanding Gate. It easily stands out from the crowd and is in a bit of a class of its own. This why it is the ONLY freestanding gate that we recommend. This gorgeous wood-trimmed baby gate is sure to complement your home. As a free-standing unit, it does not mount in any way to your walls. It features a 19.5-inch walk-thru door that swings both ways and can be locked open at 90 degrees. It has wide, stable “feet” with rubber bottoms that keep the gate from tipping or sliding around. It is adjustable in width, so you can cover a fairly large area, but is rather short at only 28” in height. It is not designed for older toddlers, however, so only choose this gate for younger children and babies. It makes a perfect barrier in front of an entertainment system or in an area that is lacking in walls to attach to. When you need a baby gate on-the-go, it is good to have one that can fold up easily into a small package to make it convenient to carry with you. A portable baby gate is great for grandma’s house, vacation, or other traveling situations. These type of gates may require a bit of assembly/disassembly, but are generally super easy to install and uninstall, as they are pressure-mounted gates that don’t require any hardware. This is a fantastic portable gate because it is so lightweight and folds up to fit into a little travel bag for easy transportation. It’s also handy because it is adjustable to different sizes and thus can be used in a wide array of spaces and can even be installed on uneven surfaces (such as happens with baseboards). It’s made with a mesh-like fabric panel between steel bars, so there aren’t any “toe-holds” like some portable gates. It will require a little bit of assembly each time you set it up or move it, but that only makes sense for something that is designed to be disassembled. The little feet at the bottom of the gate give it a stability that other gates in this class lack, so that is a feature that I especially like. Sometimes a traditional gate just won’t work due to a unique configuration, lack of opposing walls, or the need for a gate that attaches to itself. In this case, your best bet is a play yard type of gate. These do a good job of handling impossible scenarios because they can be set up in several different ways and can cover a large area. With so many play yard baby gates available, you might be wondering which ones are worth your time to consider. Each brand has its particular features, plus pros and cons. However, we have done the research to bring you the best options on the market to help save you the aggravation of weeding through the ones that aren’t worth your time. Here are our three top choices for you to look over, based on quality, design, safety, and price. Why did we chose North States Superyard 3-in-1 Metal Gate as our #1 pick? This is a great 6-panel gate that spans an area up to 12 feet and has optional 2-panel extensions that can be purchased and added. It is wonderfully versatile because you can rotate the hinges of each panel to contort it to any shape or angle. It comes in white, matte bronze, or wood to suit any decor need, and is solidly built of steel. It is designed to be permanently mounted to whatever walls you can reach, regardless of whether they are directly across from each other or not. It will stand alone as well, but ONLY if it is attached back to itself in a playpen configuration. The fact that it comes with rubber underneath its feet to protect your floors and a door that automatically closes, as well as a one-handed safety latch, shows that this gate is chocked full of awesome features. 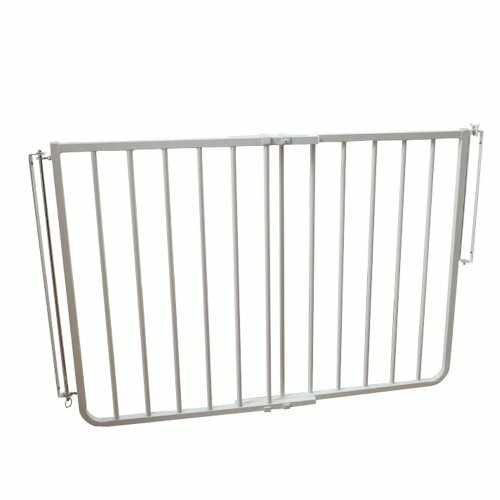 ​There are many different kinds of safety gates to cover the range of different uses and sizes that might be needed. Choosing an appropriate gate is fairly simple and straightforward, but let’s cover the basics so that A: you will know about all of your options and B: you are successful in finding the best baby gates you will need for different scenarios. ​Sometimes you need a gate to create a boundary where you have no walls or door jambs to attach it to. Sometimes you just want to block off a piece of furniture or area that has no distinct boundaries. This is when a free-standing gate comes in handy. Easily picked up and moved, they are versatile and can be put where you need them most at any given time. They aren’t great for older kids, who can just push them out of their way, but there is definitely a time and place for this kind of gate. A baby gate is your ticket to peace of mind when you have a little one that is getting to the exploring age. 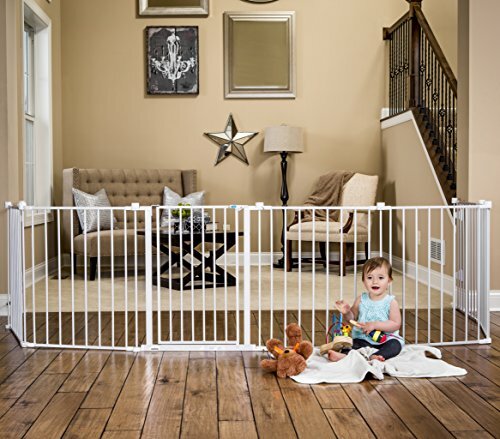 You can’t expect babies or toddlers to stay put in a corner, so by installing a safety gate, you give them the freedom to roam, yet also provide a very clear boundary. Of course if the entire house is completely babyproof-ed, you might think ‘why bother?’ But hazards are everywhere, even despite our best efforts. In most homes, the average family finds that a well-placed baby gate that keeps the explorer contained lets everyone more easily keep an eye what is going on. Baby gates are that extra layer of protection that help you breathe easy even when you are a busy parent that is multi-tasking and juggling all the activities of running a home. You should care about baby gates because baby gates make your life easier, and as a parent, you know that is reason enough. When choosing the best baby gates for your needs, it is a good idea to become familiar with the various brands that are on the market. 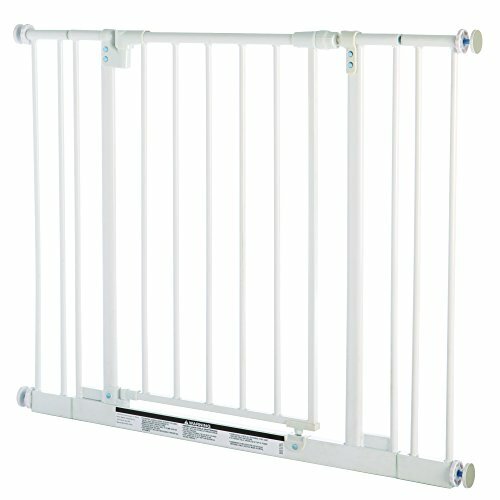 Which brands carry the type of baby gate that you need? Which ones are the sturdiest and easiest to use? Some brands specialize in fancy features or beautiful stylish pieces, while other brands focus more on functionality and keeping the cost budget-friendly. Let’s take a peek at some of the more popular brands you might encounter. This company has been around since 1953 and makes all manner of safety gates for babies and pets. Their mission is to manufacture innovative and high-quality products that are safe, durable, and easy to use. They have a large assortment of various styles, including superyards, and carry some of my top picks in certain categories, for both value and versatility. All their products are certified by the Juvenile Products Manufacturers Association (JPMA). Regalo is an industry leader in baby-proofing products. They not only make baby gates, but other safety solutions, such as bathing and travel products and bedrails, as well. You will notice several items from this brand reviewed here on this site. They tend to receive fairly good reviews on most of their gates, and are especially known for their economical prices and variety. If cost is a factor for you, the value for function is definitely observable with this company. Summer Infant is a well-known brand that often blows away the competition. Their focus on helpful features and style makes their products stand out. Their baby gate selection is broad and even their deluxe models are surprisingly affordable. They carry not only metal gates, but various wooden ones that look beautiful and are very sturdy. I have reviewed several of their gates and have noticed many other parents who also rate this company with five stars. One of the first gates I ever bought was from this stellar company that specializes in gates that retract into themselves. Not only is their customer service unmatched, but I have enjoyed my retract-a-gate for many years and have never been disappointed. Made 100% in the USA, and offering a 100% Satisfaction Guarantee, this is one of my favorite companies. The fact that their baby gates are JPMA-certified for the top of stairs is phenomenal and worthy of mention. This company tends toward simple, practical gates with basic profiles. With a range of sizes and types that span a very affordable price point, they consistently receive high reviews. Known for their lightweight aluminum gates and all metal gates with no plastic pieces, they have captured a market niche since 1993. They hand-inspect their products in Newnan, Georgia and take pride in their genuine customer service. One of the first companies to bring metal gates to the baby gate market, KidCo also has a whole line of other babyproofing products. Designed and engineered in the US, KidCo products have innovated the baby gate market with unique items such as ‘build-your-own’ gate models and ‘angle gates.’ Their products are simple and sleek and their company is family owned and operated. A trusted company with high reviews, this company prides itself in top-quality manufacturing of durable and cost-effective safety gates. I love some of their gates’ unique features, such as “stay-open” and “auto-closing” walk-thru doors. All their gates are JPMA-certified and it is obvious that this company cares about safety. One of the best-known names in baby products, Evenflo is a long-standing brand. They offer some of the most affordable gates on the market, and carry multiple styles and price points. Their headquarters and manufacturing facilities are located in Ohio, and they are committed to providing products that are #1 in safety. A well-known brand for all things related to baby-safety and babyproofing, this company has been around for over 30 years. They carry a wide range of cost-effective solutions for baby-gating your home. Their baby gates range from simple to elaborate, and come in many styles and types. They have wooden, metal, and plastic gates in many configurations, but specialize in practical and sturdy gates that are less for looks and more for function. Tested to the highest safety standards, Munchkin gates are all JPMA-certified and come with a 1-year limited guarantee. This company was founded in 1991 in Los Angeles, California with a passion for creativity and innovation for modern products for today’s parents and children. With a whole line of various styles and kinds of baby gates, it is easy to find something budget-friendly that has the features you need with Munchkin. 1. How do I install a baby gate? There is no need to worry, as baby gates are fairly easy to install. First decide what kind of safety gate you need and measure your opening. Read through the instructions that come with the gate you have chosen and put together the different sections. If your gate does not come with installation instructions in the box, many manufacturers have them available online on their website. You will need to adjust the width of the gate to approximately the right size before actually installing it, so measure the gate as you assemble it. Pressure-mounted gates don’t require any screws or probably won’t require any tools, either. If available, merely adjust the rubber knobs to make the gate fit snugly into place, taking into account the varying width of the wall and the baseboard. If you are installing a permanent-mounted gate, gather together a drill gun with a screw bit that matches the screws in the kit for easy of installation. Make sure that there is a wooden stud behind any drywall that you are screwing into so that it will tighten and hold properly. It only takes a few minutes to install a baby gate, so don’t feel intimidated by the process. Even those of us who are “less than handy” have been able to successfully get them into place without too much trouble and just a little bit of time. Many parents wonder how many baby gates do I need for my home? It’s a great question, but not necessarily easy to answer, because everyone’s situation is so different. Nevertheless, I want to give you some pointers to consider as you make these choices. This will also make a difference as to how many gates you’ll need. If you have wide open areas, you may need an extra-long gate, which would substitute (space-wise) for two or more short ones. So, taking these factors into consideration, if you have only the budget for one gate (whether small or large) the idea is to contain your baby in one area...effectively blocking your child from having access to multiple areas with the use of one gate. However, if you can buy several, you can simply block off the dangerous areas or objects, instead of your child. So, for a small home, one gate may be adequate, but for a medium-size home, two or three gates are more reasonable. If you have a large home, plan to buy between 4-6 gates, depending on the layout of your space. Also, if you have a porch or deck, you will likely need at least one gate, if not more, for making that area safe as well. I hope you now feel confident and ready to make your baby gate decisions, plus inspired to get this task done so that you will be ready for when baby begins to explore. The sooner that you tackle your baby-proofing, the better you will feel when the time is ripe and you are not scrambling to make last minute purchases and trying to install with baby clamoring around you. Also keep in mind that babies that are already familiar with baby gates in their space do a better job of accepting their boundaries later when they reach the toddling stage. May you find the very best baby gates for your family’s particular needs and may your baby always be safe!